The unassuming fruit fly has paved the way for another big scientific win: on October 2nd, the Nobel Assembly awarded the 2017 Nobel Prize in Physiology or Medicine to Jeffrey C. Hall, Michael Rosbash, and Michael W. Young for their discoveries of the molecular mechanisms behind circadian rhythms. These biologists have spent their careers studying how organisms build an internal clock that synchronizes their biology and behavior to the day-night cycle. Like many important discoveries about how life works, this story begins with one of biology’s most powerful tools: the forward genetic screen. In 1971, Seymour Benzer and Ron Konopka introduced random mutations into fruit flies and screened for mutants with a disrupted circadian rhythm. Benzer and Konopka identified these mutants by monitoring two phenotypes controlled by the circadian clock: what time of day the flies are most active in their enclosure (locomotor activity) and when they emerge from their pupal cases (eclosion). The scientists isolated three mutants with irregular rhythms, identified the single genomic locus associated with all three, and named it period (per). Over a decade later, Hall and Rosbash, colleagues at Brandeis University, and Young, working at Rockefeller University, independently cloned the period gene. This discovery provided a crucial entry point for Hall, Rosbash, and Young to begin painstakingly putting together the molecular pieces of the circadian rhythm puzzle. Rosbash and Hall found that levels of the protein product of the period gene (PER) oscillated throughout the day, peaking in the middle of the night. They also noted that per mRNA oscillated as well, though it peaked roughly six hours earlier than PER; this led them to suggest a negative feedback loop wherein the PER protein controls per mRNA expression. As the PER protein began to accumulate, they proposed, it started to put the brakes on its own synthesis. PER protein was concentrated in the cell nucleus, which fit well with this theory—but PER wasn’t capable of translocating to the nucleus on its own, and its biochemical function was still unknown. It seemed apparent that per gene regulation was directly related to the circadian clock, but the mechanism was still shrouded in mystery. Meanwhile, a few hours away in Manhattan, Young and his colleagues were identifying new circadian rhythm mutants through a P-element insertion screen; among them was timeless (tim), which mimicked the period phenotype. The tim mutation blocked nuclear localization of the PER protein. Young suggested that the tim protein product (TIM) might interact with PER to help it localize to the nucleus—a suggestion that would turn out to be true. 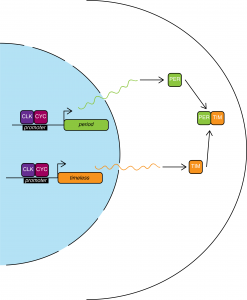 Subsequent discovery of the circadian genes clock (clk), cycle (cyc), and cryptochrome (cry) by Hall and Rosbash and double-time (dbt) by Young helped some of the last puzzle pieces click into place. 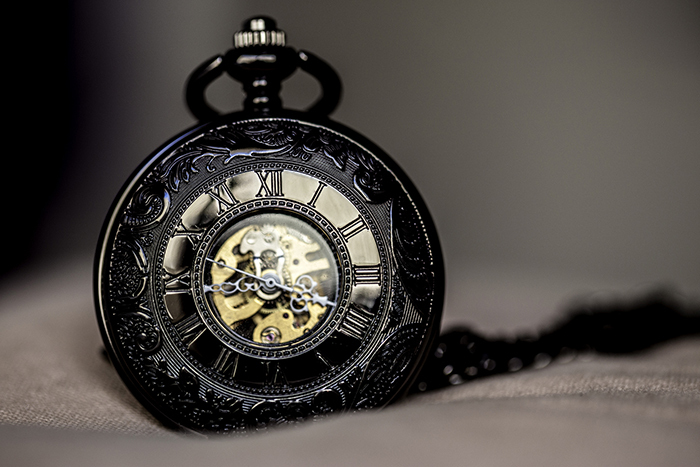 By the turn of the century, they had constructed the accepted model for molecular regulation of circadian rhythms. 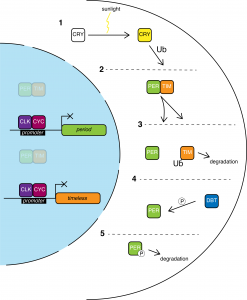 The simplified version is as follows: the transcription factors CLK and CYC dimerize and promote transcription of both per and tim. 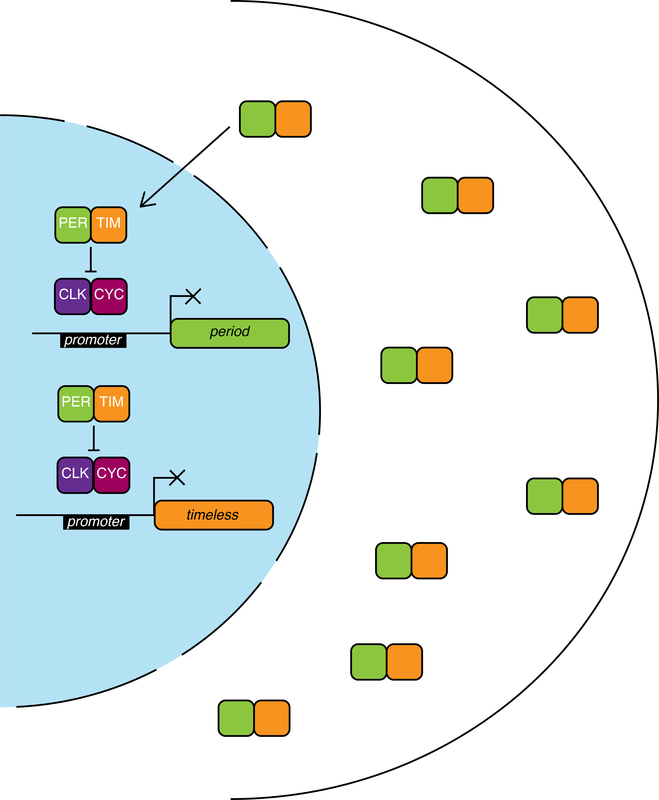 The PER protein heterodimerizes with TIM and accumulates in the cytoplasm. PER levels reach their peak in the middle of the night. PER-TIM dimers are stable and translocate to the nucleus where they remove CYC-CLK from the promoters, thus halting per and tim expression. 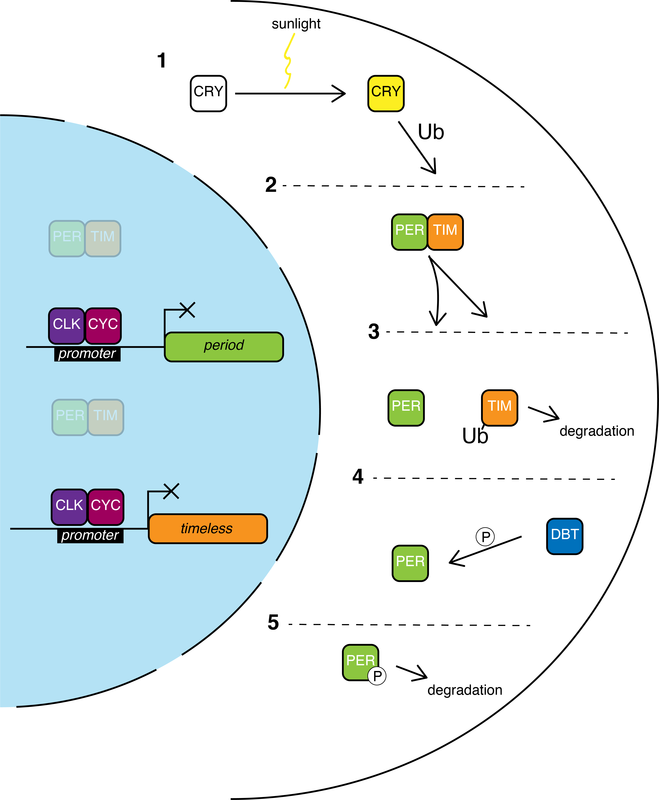 CRY acts as a photoreceptor: sunlight activates CRY, which leads TIM to be ubiquitinated, causing it to dissociate from PER and to be degraded. Solo PER is phosphorylated by DBT, marking it for degradation. This loss of PER-TIM allows CYC-CLK to resume promoting per and tim expression, starting the cycle over again. Further research has revealed similar intricate biological clocks tick in all animals, including humans. With this prize, the Nobel Assembly has again recognized the contribution of research using fruit flies; Hall, Rosbash, and Young join seven previous Drosophila biologists awarded the Nobel Prize. In fact, an impressive number of Nobel Prizes have been awarded for basic science research using model organisms—a powerful approach that the Genetics Society of America advocates for as part of its mission to advance the field of genetics. We are proud to say that Hall received the GSA Medal in 2003. All three new laureates have been long-time GSA members: Hall until his retirement, Rosbash until 2015, and Young remains one today. These outstanding members of our community show what can be done with hard work, collaboration, creativity, determination, and a pesky little fruit fly friend. Phenotypic and genetic analysis of Clock, a new circadian rhythm mutant in Drosophila melanogaster. Dosage compensation of the period gene in Drosophila melanogaster. prof premraj pushpakaran writes — 2018 marks the 100th birth year of Edward Butts Lewis!! !